Alfalfa (Medicago sativa) is a flowering perennial plant and member of the pea family that has been used as a forage crop for cattle since ancient times. Also known as lucerne in some parts of the globe, alfalfa is both a legume and an herb that can be harvested up to four times per growing season. It grows to a height of two feet with serrate leaflets and pretty lavender flowers that cluster along a central spike. 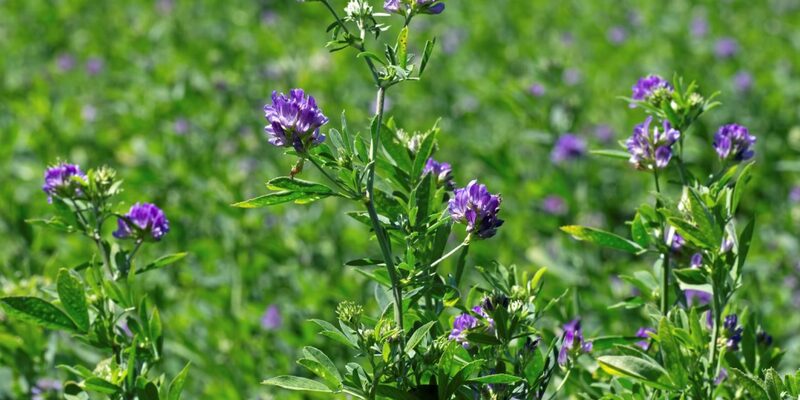 Because of its high yield, good nutritional quality, and resilience during droughts, alfalfa is considered to be the most important forage legume in the world. And for homesteaders, backyard gardeners, and hobby farmers, alfalfa provides many earth-friendly benefits. Alfalfa is rich in nitrogen, the element necessary for plant growth and development, as well as nutrient and water uptake.It is also a good source phosporous and potassium, and trace minerals like calcium, boron, iron, magnesium, zinc, and sulfur. Nitrogen fixation is the process where nitrogen in the atmosphere is made available to other living organisms. As a member of the legume family, alfalfa is among the plants capable of fixing nitrogen since its roots contain a type of bacteria that produces nitrogen. While alfalfa is growing, these nitrogen compounds allow it to thrive and compete with neighboring plants. When the alfalfa plant dies, the nitrogen it contains is released, improving soil quality and providing a boost for other plant life. Amending soil with organic matter is an absolute necessity for a thriving garden plot. A quick and easy way to improve water retention, reduce density and compaction, and prevent erosion is to add alfalfa to your soil. And because alfalfa is high in nitrogen, it helps other organic materials in your garden decompose – boosting overall soil fertility and supplying these nutrients to growing plants. Garden soil is so much more than just dirt; it is home to a vast network of bacteria, fungi, viruses, protozoa, nematodes, earthworms, and arthropods. A single teaspoon of soil contains more microbes than there are people on the planet. The invisible workers of the garden, these microorganisms help decompose organic matter, recycle nutrients, and render unhealthy soils rich and fertile. Just like a compost pile, garden soil microorganisms feed on a balance of carbon and nitrogen materials. Alfalfa stalks contain a mixture of sugars, fiber, amino acids, and protein – all of which are excellent feedstock for garden microbes. When dried into pellets or meal, alfalfa provides a near perfect carbon-nitrogen ratio of 24:1. Likewise, alfalfa added to the compost heap boosts the activity of the microbes within. A handful or two of alfalfa in the pile feeds these organisms as well, speeding up the entire decomposition process. Faster break down of organic materials generates more heat, an essential component of quick composting. Add alfalfa as a compost stimulator when you need finished humus quickly. Nematodes are microscopic roundworms with the number of species estimated at more than 40,000. Half of these are beneficial, “free living” types that play an important role in soil ecosystems by feeding on algae, fungi, dead organisms, and insect larvae. The other half are parasitic nematodes, and when present in garden soil, feed on plant roots which has a negative impact on plant health and yield. Because alfalfa is a good source of nutrients, fixes nitrogen, and creates ideal soil tilth, it makes for a wonderful cover crop to plant between growing seasons. Sow alfalfa seeds in the autumn, after you’ve harvested your last crop and cleaned up the garden bed. Prevent them from going to seed by cutting them back or running a lawn mower over them. Leave cut stalks on the soil surface and allow them to dry completely. You can till this plant matter back into the soil when ready to plant again or let it be and use it as mulch. Like other legumes, alfalfa plants are host to a wide variety of “good guy” insects that prey on other pests. Wherever alfalfa is planted, it attracts voracious predators like bigeyed bugs, damsel bugs, minute pirate bugs, lady bugs, and parasitic wasps. These insects will feed on nearby populations of aphids, thrips, spider mites, and armyworms and serve as stellar biological controls. When alfalfa plants are treated with insecticide, it causes a prompt return of these unwanted pests in the fields. Alfalfa is grown throughout the world as a forage food, harvested as hay, or used as green chop. Although large scale farms certainly benefit from growing alfalfa, smaller operations can take advantage of alfalfa as animal fodder too. While the stalks and leaves of the alfalfa plant are edible parts for our animal friends, the seeds can be collected, sprouted, and consumed in the form of alfalfa sprouts as a healthy snack for us too. Per cup, alfalfa sprouts are very low in calories (7.6) and yet provide a good source of protein, dietary fiber, vitamin A, vitamin C, vitamin K, thiamin, riboflavin, folate, pantothenic acid, iron, magnesium, zinc, phosphorous, copper, and manganese. Alfalfa seeds can be collected after flowers have been pollinated and a seedpod develops. To sprout the seeds, simply place seeds in a glass jar, add a few inches of cool water, and cover with a cheese cloth and rubber band. Let them soak overnight and drain the water. After about six days, you’ll have a jar full of alfalfa sprouts. Grow Alfalfa From Seed – Alfalfa is incredibly easy to grow. Plants prefer full sun and a neutral soil pH but can adapt to a wide variety of growing conditions. After the plant is established, take fresh cuttings and work them into your garden soil for an instant nutrient boost. Dried alfalfa stalks can also be used as hay for lasagna gardening. Alfalfa Meal – Dried and crushed alfalfa can be sprinkled around your garden beds to improve soil fertility. Pick up a 5-pound box of alfalfa meal here. Alfalfa Pellets – Alfalfa meal pressed into pellet form, toss handfuls around the garden or bury them in the soil. Purchase a 10-pound bag of alfalfa pellets here. Alfalfa Tea – Brew up some alfalfa tea as an all-purpose fertilizer or foliar spray. To make, add one cup of alfalfa meal to five gallons of water and let it steep for several days. Be warned, this concoction will smell fairly offensive but your plants will love it. If you want to find more Gardening How-To’s, take a look at the Shoestring Gardener Book! With 300+ pages, you will be able to replace all of the toxic products in your garden with hundreds of eco-friendly, creatively frugal gardening tutorials, remedies & tips. In addition, they offer you Frugal-minded Pricing Just for YOU! GET THE SHOESTRING GARDENER BOOK NOW!